With the JBL One Series 104 reference monitors, we started with the mission to give content creators the ability to hear all the details for better results while mixing and editing. Drawing on seven decades of JBL Professional engineering, the 104s represent an innovative new set of speakers, designed from the ground up to provide the most accurate sonic presentation of any monitors in their class. With the amazing sound that’s made JBL the top choice for recording studios, cinemas and live concert stages in a compact, affordable, and stylish desktop speaker, JBL 104 Powered Reference Monitors are ideal for recording musicians, podcasters, and music and video producers—as well as anyone seeking enjoyable listening experience. With JBL 104 Reference Monitors, you’ll hear true clarity and detail, with no coloration. The 104s deliver crisp highs and rich bass just as intended. They’re optimized for desktop placement, with neutral low-frequency performance. And their smooth off-axis response means you can monitor with confidence in a wide sweet spot. The world’s top recording studios and touring artists rely on JBL Professional monitors to deliver unparalleled fidelity and performance. Now, we’ve optimized that technology in our smallest form factor ever. The 104 Reference Monitor’s innovative new coaxial driver design features a high-frequency driver aligned with a precisely contoured woofer cone to deliver accurate response, exceptional detail and impressive off-axis performance, for the most neutral, accurate presentation, desktop to desktop, room to room. The cabinet’s precisely contoured low-frequency port works with the driver to provide accurate bass at all listening levels. And with low frequency extension down to 60 Hz, you’ll be impressed with the bass you get, even without a subwoofer. 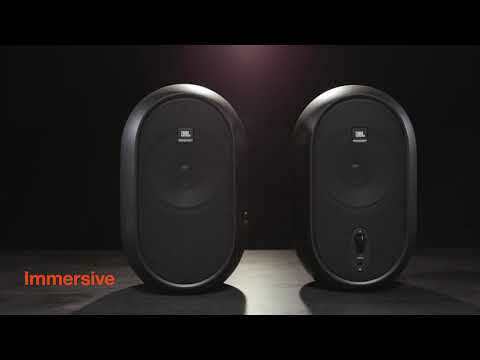 JBL One Series reference monitors were created with the modern production lifestyle in mind. They not only feature a sleek, new look for JBL, but with their compact size, creators can get legendary JBL sound even in smaller workspaces. Smart features like a front-panel volume control allows convenient level adjustments without straying from the sweet spot, the front-panel headphone jack automatically mutes the speakers, providing isolation in one simple step, and dual 1/4-inch balanced and single 1/8-inch unbalanced TRS inputs accommodate a wide range of sources. Master and extension speaker sold as a set. Coaxial 4.5-inch (118 mm) LF contoured driver and integrated .75-inch (19 mm) soft-dome HF driver. Moulded ABS cabinet with contoured low-frequency port. Integrated 60-watt Class D power amplifier; 30 watts distributed to each speaker. Acoustically optimised for desktop placement. Three sets of inputs allow connection with professional equipment, personal music players and consumer-level devices. Master monitor includes electronics for the extension monitor, minimising wiring and clutter. Front-panel headphone jack with speaker mute feature.